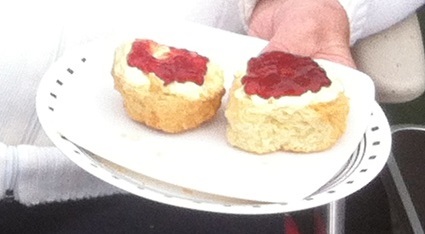 We had 11 units, plus an Associate Member, attend the Cream Tea Rally which was the 3rd of our 25th Celebration Rallies. It was a busy few days with a BBQ Chef competition on Friday which Bill won with Maggi's assistance. They received a Fleetwood apron and winners certificate as a prize. On Saturday we had a boules competition for the Keith Forder Cup as well as our celebration event. We took a break to enjoy sandwiches, cakes and the cream scones before David (Hazel was unable to play so he used his left hand for her turn) was beaten in the final by Allan & Jackie. Sunday found us at a local pub for a carvery. Many of us found time to visit Hidcote Gardens, a local National Trust property where they had just set up a Sculpture Trail. There are a number of pictures of this and the gardens.